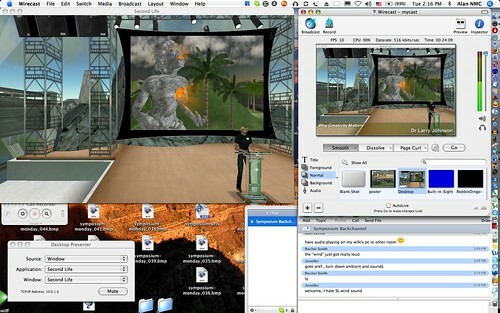 For the NMC Symposium on Creativity in Second Life, I put Wirecast to the test. As a streaming video solution, it allows me to broadcast a window of a desktop application, in this case Second Life, out to our streaming server (a hosted XServe), much like QuickTime Broadcaster can do as a free app, but with so much more..... Broadcaster cannot do an app window, and Wirecast allows you to dynamically compose layered effects (title screens) and switch between video sources with transitions. Audio was a bit trickier. Larry was talking via our streaming audio server, which is not captured as output anywhere in Wirecast-- until I remembered Soundflower, the free app that creates virtual sound channels. In my Mac Sound panel, I set the default output to SoundFlower, which I could then pick up as an audio source in Wirecast. So top left is my SL view, essentially a camera. The Wirecast controls are in the right, and the desktop presenter in bottom left (bottom right is a Skype chat opened that we used for team communication). This setup was done primarily to overcome the audience limits of SL- 60-65 per sim; by broadcasting the view as video, we can attach to any other place in SL, record a video archive. It worked flawlessly. The second time we did it, rather than just stream the view of the ending video (Robbie Dingo's Watch the World(s)), I had downloaded the source video, and then used Wirecast to switch sources from SL to this video. The recorded video is sweet! I was surprised I could do this on a single machine-- for future use, it looks like I am going a two machine set up- where I will use a high end PC to be my Sl display and route the video to my Mac.